Unlocking the Mystery of Life is a compelling documentary by Illustra Media examining the scientific case for intelligent design -- an idea with the power to revolutionize our understanding of life…and to unlock the mystery of its origin. It tells the story of contemporary scientists who are advancing a powerful but controversial idea... the concept of "intelligent design." It is a theory based upon overwhelming biochemical evidence. Using state-of-the-art computer animation this documentary transports you into the interior of the living cell to explore systems and machines that bear the unmistakable hallmarks of design. Rotary motors that spin at 100,000 rpm. A biological information processing system more powerful than any computer network. And a thread-like molecule that stores instructions to build the essential components of every living organism on earth. Unlocking the Mystery of Life documents how scientists are abandoning naturalistic explanations for the origin of genetic information and looking to theories of design for new answers. 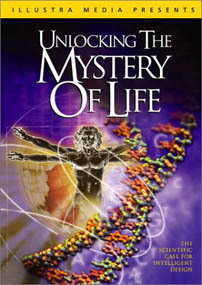 Purchase Unlocking the Mystery of Life English, Spanish, and Chinese versions available. Illustra Media's YouTube Channel. Full video available free online in 12 Chapters. This page was last modified on 4 August 2015, at 13:11.